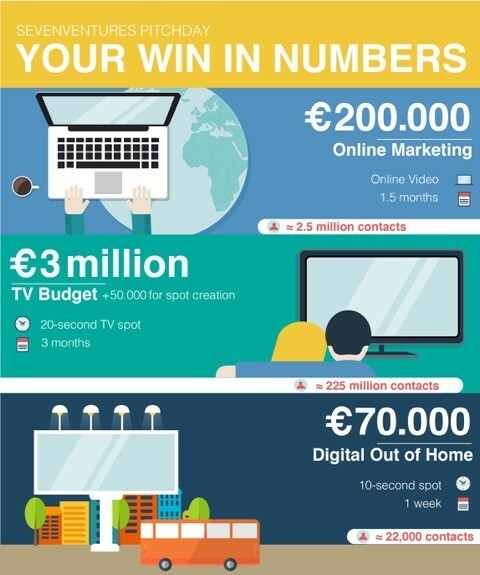 Pitch and win EUR 3 million worth of TV media, online advertising worth EUR 200,000, and for the first time this year a digital out-of-home campaign worth EUR 70,000. The SevenVentures Pitch Day will be held in Munich at the DLDsummer Conference on June 16-17, 2016. The finalists are: Bux, Exporo, Kitchenstories, Happn, Tinkerbots and carwow. Pitch and win EUR 3 million worth of TV media, online advertising worth EUR 200,000, and for the first time this year a digital out-of-home campaign worth EUR 70,000. The finalists are: Bux, Exporo, Kitchenstories, Happn, Tinkerbots and carwow. Founders instead of gladiators, storytelling instead of swordplay, and creativity instead of combat; still, there is a lot at stake for the contestants. According to Forbes, the SevenVentures Pitch Day is one of the most important start-up contests in the world. The venue for this mega battle is the media city of Munich. The investment arm of the ProSiebenSat.1 Group is hosting the start-up contest for the fifth year in a row and the DLDsummer Conference is the perfect arena for this contest. The SevenVentures Pitch Day gives fast-growing B2C enterprises the chance to present their business models to an international audience; and the winner will have the chance to reach an audience of millions through TV and online advertising. Six innovative enterprises have qualified for the SevenVentures Pitch Day. The winner will be able to take their company to the next level with the aid of TV advertising. The prize offered by SevenVentures is a full-service media package. The first part of this package consists of TV media worth EUR 3 million. A 20-second ad spot running for two months on ProSieben’s six TV channels can generate approximately 225 million impressions. In addition, ProSieben will sponsor EUR 50,000 for spot development. The second part of the prize package consists of an online marketing budget worth EUR 200,000, with which the winning start-up can generate 2.5 million impressions in one and a half months. The final part is a digital out-of-home budget worth EUR 70,000. A 10-second ad message placed on digital outdoor advertising platforms can generate up to 22,000 impressions in a week. The duration and impressions generated by any advertising campaign depend on the campaign’s planning and target group. The six finalists that qualified for the SevenVentures Pitch Day now have the chance to take their business to the next level by winning this awesome prize package. The following finalists will participate in this year’s SevenVentures Pitch Day: BUX puts Wall Street on your smartphone, making trading stocks as easy as playing a game. EXPORO’s innovative crowd-investing platform makes it easy to invest directly in real estate. The recipes and videos of the cooking app KITCHENSTORIES will make you hungry for more. The dating app HAPPN gives you a second chance at a first impression, because it enables you to meet up with the people you encounter every day. TINKERBOTS lets you build your own robots with ease and CARWOW is the internet portal that lets you easily compare the best offers on new car. The pitches will be evaluated by a jury of experts consisting of SevenVentures CEO Sascha van Holt, Accel’s investment expert Luciana Lixandru and WIRED’s Editor-in-Chief Nikolaus Röttger. In the elevator pitch, the contestants will have three minutes to present their business concept with enthusiasm, showmanship and expertise. After each pitch, the finalists will be grilled by the jury. We are happy to have a Steven Gätjen on board. Steven Gätjen is our moderator and will guide us through this amazing event. He is a showman expert, who you may recognize from “Schlag den Raab”. In their early years start-ups rarely have the budget for expensive TV advertising. Instead, they can trade equity or revenue for advertising time on the channels of the ProSiebenSat.1 Group (media-for-equity). Probably everyone who watches television in Germany is familiar with at least one success story of the SevenVentures portfolio: The TV spots featuring the “Zalando scream” reached an iconic status amongst the German TV audiences and were extremely efficient in generating traffic/success for this online retailer, which has some of the highest sales in Germany today. SevenVentures also supported other impressive success stories like JustFab, Lieferando and auxmoney. The SevenVentures Pitch Day has been held every year since 2012. Earlier winners include Withings, Cashboard, GetYourGuide and Popsa. You can find additional information about the 7VPD on Facebook, Twitter and Youtube. DLD is the international conference and innovation platform of Hubert Burda Media. DLD Media organizes Europe’s leading digital conference DLD and the summer conference DLDsummer in Munich, DLDnyc in New York City, DLDeurope in Brussels, and DLDtelaviv, Israel’s largest tech festival, in Tel Aviv. In addition, with the format DLDsalons, DLD organizes networking events around the world, for instance in Palo Alto, London, Istanbul, Barcelona, Moscow, Los Angeles, Rio de Janeiro, and Beijing. Over DLD’s ten-year history, its many prominent speakers have included Reid Hastings (Netflix), Jan Koum (WhatsApp), Travis Kalanick (Uber), Mark Zuckerberg (Facebook), Eric Schmidt (Google), Sean Parker (Napster), Marissa Mayer (Yahoo! ), Sheryl Sandberg (Facebook), and many more. The company’s managing directors are Stephanie Czerny, who co-founded the DLD conference in 2005, and Dominik Wichmann, who has served as managing director and editor-in-chief since September 2015. Sascha van Holt is CEO of SevenVentures and heads the investment business since its foundation in 2011. Prior to this role he worked as an investment professional for a top tier private equity firm. Earlier assignments include corporate positions and entrepreneurial work.